Citation: Witalis M, St-Onge P, Suh W. -K.(2016) Angioimmunoblastic T Cell Lymphoma (AITL): Origin, Pathogenesis and Therapeutic Options. J Immunol Res Ther, 1(1): 29-36. Copyrights: ©2016 Witalis M, St-Onge P, Suh W. -K. This is an open-access article distributed under the terms of the Creative Commons Attribution License, which permits unrestricted use, distribution, and reproduction in any medium, provided the original author and source are credited. The germinal center (GC) provides a unique microenvironment in which GC B cells get selected and differentiate into long-lived plasma cells or memory B cells through intimate interactions with T cells. Since selected B cells undergo multiple rounds of DNA damage/repair processes and clonal expansion within the GC, it is not surprising that many types of B cell lymphomas originate from GC B cells. Interestingly, T follicular helper (Tfh) cells, T cells specialized in facilitating B cell selection and differentiation within the GC, are also prone to malignant transformation giving rise to angioimmunoblastic T cell lymphoma (AITL). Multiple genetic alterations underlying AITL transformation have been recently discovered and detailed mechanisms of AITL lymphomagenesis are expected to be elucidated. Regardless of its etiology, AITL tumor cells appear to maintain the signaling components of its precursor Tfh cells such as inducible costimulator (ICOS) and signaling lymphocytic activation molecule (SLAM)-associated protein (SAP). We propose here that exploiting these Tfh signaling pathways may provide better therapeutic options for AITL over conventional chemotherapies. Angioimmunoblastic T cell lymphoma (AITL) is a late-onset peripheral T cell lymphoma, representing 18.5% of mature T/NK cell malignancies . Symptoms include generalized lymphadenopathy, hypergammaglobulinemia, and hemolytic anemia with poor prognosis (five-year overall survival ~33%). AITL tumors display effacement of the lymph node (LN) architecture with prominent arborization of endothelial venules. Because this malignancy manifests in elderly patients (avg onset ~64 yr), aggressive interventions are typically avoided and conventional chemotherapy has been the sole treatment. However, multiple variations of chemotherapy regiments of AITL have shown poor efficacy and more innovative treatment is eagerly awaited . Importantly, an accumulating body of evidence indicates that AITL originates from T follicular helper (Tfh) cells, probably associated with germinal center (GC) reaction. In this review, we will summarize data that support the Tfh origin of AITL and propose a model that may explain the etiology of AITL. At the end, we will discuss T cell costimulatory signaling pathways as potential therapeutic targets for AITL. Tfh cells are a subset of CD4 T cells whose differentiation is driven by the lineage-specifying factor Bcl6 . Tfh cells express CXCR5 chemokine receptor, inducible T cell costimulatory receptor (ICOS), and programmed cell death protein 1 (PD-1) on the cell surface and produce IL-4 and IL-21 as effector cytokines. Tfh cells have the unique ability to migrate into B cell follicles in secondary lymphoid organs to form GCs. 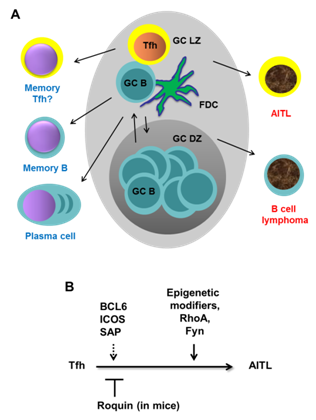 The GC is a microenvironment in which antigen-specific B cells are selected through interaction with Tfh cells to become either antibody producing plasma cells or memory B cells  (Figure 1A). Since failure to produce Tfh cells leads to immunodeficiency whereas excessive Tfh responses induce autoantibodies, the generation and function of Tfh cells is highly regulated by multiple molecular and cellular mechanisms [5,6]. Precursor Tfh (Pre-Tfh) cells are generated during dendritic cell-mediated T cell priming under the influence of IL-6 and IL-21 (mouse) or IL-12 (human). However, the pre-Tfh population fails to fully differentiate into mature GC Tfh cells unless they interact with cognate B cells to reinforce their differentiation programs by upregulating Bcl-6. The intimate T-B interactions during GC reactions depend on T cell costimulatory signals mediated by multiple T cell costimulatory receptors (see below). Multiple lines of evidence strongly suggest that Tfh cells are the origin of AITL [7-15]. First, although T cells represent a small fraction of the total tumor mass, it was confirmed that T cells are the ones that undergo neoplastic transformation . This expansion of Tfh-like tumor cells appears to cause expansion of B cells and infiltration of other immune cells. Secondly, immunohistochemical studies have shown that AITL tumors express high levels of Tfh markers: PD-1, CXCL13, ICOS, SAP, and BCL6 [9-11,13]. Thirdly, gene expression profiling of highly enriched T cells from AITL samples revealed “Tfh signatures” [7,8,14]. Lastly, in a mouse model of AITL termed Roquinsan +/-mice (see below), abrogation of genes that are known to be crucial for generation of Tfh cells and germinal center formation (such as CD28, ICOS and SAP) dramatically reduced AITL-like tumor incidence . Together, these findings strongly support the idea that AITL arises from Tfh cells during germinal center reaction. Although it is becoming clear that AITL arises from Tfh cells, the genetic alterations causing the transformation remain poorly understood. Recently, three studies using genome-wide sequence analysis shed light on this issue [16-18]. These studies unanimously revealed high frequency of recurrent point mutations in the small GTPase RHOA gene and multiple genes involved in epigenetic modification and T cell signaling. The Gly17Val (G17V) mutation in RHOA gene is present in 53-68% of AITL tumor samples [16-18]. This mutation has been uniquely found in AITL but not in other types of T cell, B cell, or myeloid malignancies [17,18]. Mechanistically, Gly17Val mutation abrogates the GTP binding ability of RHOA  increasing its association with guanine-exchange factors [16,17]. This may explain why G17V RHOA protein shows dominant negative functions in transcriptional regulation and actin remodeling when overexpressed. One study has shown that, when overexpressed in Jurkat leukemia cells, G17V RHOA enhanced cellular proliferation and invasiveness . However, similar experiments by another group showed no differences in proliferation . Therefore, it remains to be seen how and to what extent this dominant negative mutation of RHOA contributes to the transformation process of AITL. A group of mutations frequently found in AITL belong to genes encoding epigenetic modifiers: Tet methylcytosinedioxygenase 2 (TET2), DNA (cytosine-5)-methyltransferase 3A (DNMT3A), and isocitrate dehydrogenase 2 (IDH2) [16-18]. TET2, DNMT3A, and IDH2 dynamically modulate methylation status of DNA and histones directly or indirectly affecting gene expression profiles. These genes are altered in multiple hematologic malignancies including AITL [19-21]. Importantly, some mutations in TET2 and DNMT3A genes were discovered in both non-tumor and tumor hematopoietic cells . Interestingly, in this study, all the RHOA mutated AITL tumor samples also had TET2 mutations. This suggests that TET2 mutation precedes and possibly be a prerequisite of RHOA mutation during a multi-step process of AITL transformation . However, Palomero et al. documented that approximately 25% of AITL tumors have RHOA mutation without TET2 mutation arguing against the sequential mutation events . In addition, Palomero et al. identified a less prevalent (3% of AITL), yet mechanistically well-defined mutation in the FYN gene. FYN is a member of SRC family kinase that plays an important role in TCR signaling . Three different mutations were found in FYN: two in the SH2 domain and one in the C-terminal inhibitory tyrosine residue. These mutant FYN proteins showed higher kinase activity, most likely because these residues are responsible for keeping FYN in an inactive conformation. The authors also showed that the activity of mutant FYN could be inhibited by a SRC kinase inhibitor dasatinib suggesting that this subset of AITL may be treated by dasatinib. Overall, the data suggest that AITL arises through the accumulation of multiple somatic mutations in genes involved in epigenetic modifications, small GTPase RHOA, and TCR signaling components. However, several questions remain to be answered regarding the role of these mutations in the pathogenesis of AITL. First, what in vivo roles does each individual mutation play? Second, how do these multiple mutations cooperate to culminate in cellular transformation? Third, is there a “driver” mutation that initiates a cascade of events leading to AITL or is the accumulation of independently arising multiple mutations sufficient? Fourth, what are the cell-intrinsic and/or extrinsic factors that promote the accumulation of the AITL signature mutations in Tfh cells in the GC? Many of the questions listed above could be addressed through the use of genetically modified mouse models. Recently, Vinuesa and colleagues found that mice possessing one copy of the san allele, a dominant negative point mutation of the Roquin gene (Roquinsan/+ mice), develop an AITL-like disease: asymmetric LN tumors, oligoclonal expansion of Tfh cells, effacement of the LN architecture, arborization of endothelial venules, and hypergammaglobulinemia . The san point mutation of Roquin is known to dysregulate the stability of numerous mRNA species including that of ICOS in CD4 T cells due to the disruption of Roquin-mediated mRNA degradation [23,24]. This leads to lupus-like autoimmune disease admixed with AITL-like disease in all Roquinsan/san mice within 4-months of age . In contrast, Roquinsan/+ mice do not develop lupus-like disease but still manifest AITL-like disease (~50% penetrance at 6-months of age) . This work prompted a study with a cohort of AITL patients to see if alterations of ROQUIN expression levels or mutations are associated with AITL . No alterations in the ROQUIN locus or its mRNA and protein expression levels were detected in this study suggesting that alteration of ROQUIN does not normally happen during AITL development. One possibility is that Roquin heterozygosity may represent one of many mechanisms that promote hyperactive Tfh program which leads to mutation of AITL-causing genes. However, further work is required to establish a potential relationship between Roquinsan mutation and more direct oncogenic events that cause AITL-like disease in this mouse model. Meanwhile, Roquinsan/+ mice may offer opportunities to study molecular pathogenesis and discover therapeutic targets for AITL. For example, consistent with the notion that AITL originates from Tfh cells within the GC, germline ablation of genes that are critical for Tfh generation and germinal center formation, such as ICOS and SAP, drastically reduced the incidence of tumors in Roquinsan/+mice . Another important question that can be addressed using this mouse model is the contribution of multiple T cell costimulatory receptors and their downstream signaling pathways in the disease progression of AITL (see below). It is well established that several B cell lymphomas such as Burkitt lymphoma, follicular lymphoma, and diffuse large-cell B cell lymphoma (DLBCL) are derived from GC B cells . As discussed above, new pieces of evidence indicate that Tfh cells are also at risk of becoming lymphomas. What could be the driving force for transformation of these GC-derived B and T lymphomas? For B cell lymphomas, it can be readily explained by the biology of GC B cells. Selection of class-switched, affinity matured B cell clones involves DNA remodeling and proliferation at the GC B cell stage. Failure of this delicate coordination can lead to a rapid expansion of B cells that carry oncogenic legions, which are typically chromosomal translocations that allow dysregulated expression of oncogenes such as c-MYC (Burkitt lymphoma), BCL2 (follicular lymphoma), or BCL6 (DLBCL). It remains elusive how Tfh cells are driven to become cancer. In contrast to GC B cells, Tfh cells do not undergo DNA rearrangement within the GC. This is reflected in findings that somatic mutations identified in AITL cells are predominantly point mutations but not chromosomal translocations [16-18]. A common feature of GC B cells and Tfh cells is the high level of BCL6 expression. BCL6 is absolutely required for the regulation of genes involved in Tfh or GC B cell differentiation, but can also act as an oncogene when its expression is deregulated [3,28]. Dysregulated expression of Bcl6 in mice modeled after a human DLBCL legion led to progressive lymphoproliferation and DLBCL-like disease . In another mouse model, constitutive Bcl6 expression in T and B cells led to low level T and B lymphomas [30-32]. However, when these mice were exposed to other oncogenic hits the incidence of T cell lymphoma increased dramatically. In B cells, the oncogenic effects of BCL6 is likely mediated by its ability to enhance proliferation by inhibiting cell cycle control mechanisms  and rendering GC B cells more tolerant to DNA damage by suppressing DNA damage response pathways . Whether BCL6 plays similar roles in T cells remain to be tested. However, there is evidence that Bcl6-positive Tfh cells are more proliferative than their Bcl6-negative counterparts in mice . Consistent with this, when single cell suspensions of human AITL tumors were serially passaged in immune-deficient mice, BCL6-positive, putative neoplastic AITL cells outcompeted BCL6-low T cells and B cells . Although it is yet to be confirmed in humans, a study in mice showed that Tfh cells normally downregulate BCL6 after GC reaction and concomitantly lose proliferative capacity . Taken together, these results suggest that AITL cells maintain a high level of BCL6 expression and that this might be necessary for their neoplastic behavior. support oncogenic processes. However, more work is required to establish how and to what extent Bcl6 promotes AITL transformation. Can we stop AITL progression? Once transformed, AITL cells grow and spread to other lymph nodes . Understanding molecular pathways that are involved in this disease progression should help design better therapeutic options. In this regard, what we know about the role of the T cell costimulatory receptors ICOS and SLAM family receptors may help improve treatment of AITL. ICOS is an Ig superfamily transmembrane receptor belonging to the CD28 family . ICOS is expressed in T cells after activation and binds to ICOS ligand (ICOSL) expressed on the surface of B cells and other cells . 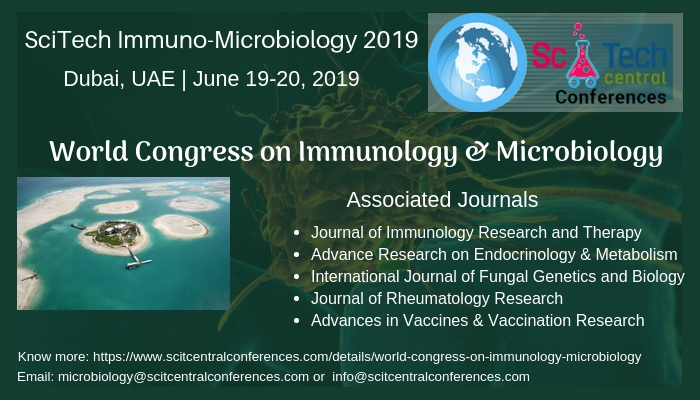 In contrast to CD28 which regulates T cell expansion through induction of IL-2, ICOS mainly regulates effector cytokines (IL-4 and IL-21) and cellular mobility [39-41]. One of the major roles of ICOS is to regulate Tfh generation and function, hence ICOS- or ICOSL-deficiency leads to primary immunodeficiency both in humans [42-44] and mice [45-49]. On the other hand, dysregulated ICOS/ICOSL expression and function are highly associated with antibody-mediated autoimmune diseases in humans (e.g., rheumatoid arthritis) [50,51] and mice (e.g., Roquinsan/san mice) [23,25]. We and others have shown that ICOS can induce two intracellular signals: phosphoinositide 3-kinase (PI3K) and intracellular calcium flux [39,40]. By generating a knock-in mouse line termed ICOS-Y181F in which ICOS-PI3K signaling is selectively abrogated, we demonstrated that the ICOS-PI3K signaling axis promotes formation of Tfh cells in part through the transcriptional control of key Tfh cytokines IL-4 and IL-21 . Importantly, IL-4 and IL-21 promote B cell growth and differentiation and IL-21 can serve as an autocrine growth factor for Tfh cells [52,53]. Further, we uncovered ICOS-PI3K-mTOR signaling in CD4 T cells that has a capacity to acutely increase the translational efficiency of IL-4 during antigen-specific T-B interactions . A more recent in vivo imaging study indicates that ICOS-PI3K signaling plays a critical role in keeping pre-Tfh cells motile in the T-B border to enhance the chance for pre-Tfh cells to encounter cognate B cells , a prerequisite for stable T-B conjugate formation and entry into the GC. Lastly, ICOS signaling has an ability to enhance the survival of activated CD4 T cells in settings of cancer immunotherapy [55,56] and autoimmune disease . Apart from PI3K, we have shown that ICOS can also induce intracellular calcium flux in a PI3K-independent manner . This ICOS-calcium signaling promotes a feed-forward loop between ICOS and the CD40 pathway, enhancing cytokine production during T-B collaboration within the GC [58,59]. Therefore, ICOS utilizes PI3K and calcium-mediated signaling pathways to promote T cell motility, cytokine production, survival, and T-B crosstalk. It is conceivable that these signaling components may continue to operate even after Tfh cells have become neoplastic. Another key protein that is critical for the maturation and function of Tfh cells is the “signaling lymphocytic activation molecule (SLAM)-associated protein” (SAP), an adaptor protein for SLAM family receptors [60-62]. SLAM family receptors (nine members so far identified) are widely expressed in hematopoietic cells. Mostly through homotypic interactions, SLAM receptors mediate antibody responses, cytotoxicity, adhesion, autoimmunity, and lymphocyte development [61,62]. Importantly, defective SAP functions cause X-linked lymphoproliferative disease (XLP) in human patients . XLP is characterized by abnormal responses to Epstein-Barr virus infections, lymphoproliferative syndromes, and immunoglobulin deficiencies caused by defective Tfh cells. SAP has a single SH2 domain that binds to immunotyrosine switch motifs located in the cytoplasmic tails of several SLAM family receptors including CD84, Ly108, and SLAM. Studies using knockout and knock-in mouse lines delineated Fyn-dependent or independent SAP signaling. SAP can recruit Fyn to ligated SLAM family receptors to augment IL-4 production in CD4 T cells . However, SAP can promote GC reactions and antibody responses independently of the SAP-Fyn signaling axis [65-67]. Fyn-independent SAP signaling plays a critical role in the formation of stable T-B conjugates in the mid-phase of GC reaction, a prerequisite for the formation of functional Bcl-6hi GC Tfh populations [68-70]. The SLAM family members that are mainly responsible for this appear to be CD84 and Ly108 . Although SAP might also be expressed in B cells, it is clear that SAP expression in T cells is both sufficient and necessary for GC reaction [65-67]. In summary, SLAM family receptors such as CD84 and Ly108 enhance T-B adhesion and cytokine production through SAP-mediated signaling in T cells at mid- and late-phase of GC reaction. Since ICOS and SAP promote Tfh cell motility and T-B collaboration, they may play a critical role in the progression of Tfh-derived neoplastic AITL tumor cells. Consistent with this idea, ICOS and SAP are highly expressed in T cells from human AITL samples [10,11]. Therefore, one could predict that interruption of T-B interactions through blockade of ICOS or SAP signaling may slow or stop tumor cell expansion and dissemination. AITL is the second most prevalent mature T/NK malignancies for which better therapeutic options are eagerly sought . Pathological observations, gene expression profiling, and cancer genome sequencing studies strongly suggest that AITL arises from Tfh cells through accumulation of multiple somatic mutations (Figure 1). We propose that sustained BCL6 expression and hyperproliferation, common features of Tfh and GC B cells, may expose these lymphocytes in the GC environment to a high risk of transformation. Based on normal Tfh biology and pathological data from AITL, we predict that signaling pathways mediated by ICOS/ICOS-PI3K or SAP/SLAM family receptors may be crucial for neoplastic expansion and spreading of AITL. Importantly, there are multiple clinical trials targeting ICOS/ICOSL , PI3K isoforms , and SLAM family receptors  to treat autoimmune diseases and cancer producing promising results. Validation of these ideas in mouse models should galvanize new approaches to treat AITL patients using these emerging drugs. This work is supported by an operating grant from Cancer Research Society (W.-K. S.). M.W. is a recipient of Graduate Scholarship from Canadian Institutes of Health Research. Federico M., Rudiger T, Bellei M., Nathwani BN, Luminari S, et al. (2013) Clinicopathologic characteristics of angioimmunoblastic T-cell lymphoma: analysis of the international peripheral T-cell lymphoma project. J Clin Oncol 31: 240-246. Xu B, Liu P (2014) No survival improvement for patients with angioimmunoblastic T-cell lymphoma over the past two decades: a population-based study of 1207 cases. PLoS One 9: e92585. Crotty S (2014) T Follicular Helper Cell Differentiation, Function, and Roles in Disease. Immunity 41: 529-542. Victora GD, Nussenzweig MC (2012) Germinal centers. Annu Rev Immunol 30: 429-457. Pratama A, Vinuesa CG (2014) Control of TFH cell numbers: why and how? Immunol Cell Biol 92: 40-48. Suh WK (2015) Life of T Follicular Helper Cells. Mol Cells 38:195-201.
de Leval L, Rickman DS, Thielen C, Reynies A, Huang YL, et al. (2007) The gene expression profile of nodal peripheral T-cell lymphoma demonstrates a molecular link between angioimmunoblastic T-cell lymphoma (AITL) and follicular helper T (TFH) cells. Blood 109: 4952-4963. Piccaluga PP, Agostinelli C, Califano A, Carbone A, Fantoni L, et al. (2007) Gene expression analysis of angioimmunoblastic lymphoma indicates derivation from T follicular helper cells and vascular endothelial growth factor deregulation. Cancer Res 67: 10703-10710. Yu H, Shahsafaei A, Dorfman DM (2009) Germinal-center T-helper-cell markers PD-1 and CXCL13 are both expressed by neoplastic cells in angioimmunoblastic T-cell lymphoma. Am J Clin Pathol 131: 33-41. Marafioti T, Paterson JC, Ballabio E, Chott A, Natkunam Y, et al. (2010) The inducible T-cell co-stimulator molecule is expressed on subsets of T cells and is a new marker of lymphomas of T follicular helper cell-derivation. Haematologica 95: 432-439. Roncador G, Garcia Verdes-Montenegro JF, Tedoldi S, Paterson JC, Klapper W, et al. (2007) Expression of two markers of germinal center T cells (SAP and PD-1) in angioimmunoblastic T-cell lymphoma. Haematologica 92: 1059-1066.
de Leval L, Gisselbrecht C, Gaulard P (2010) Advances in the understanding and management of angioimmunoblastic T-cell lymphoma. Br J Haematol 148: 673-689. Sato F, Ishida T, Ito A, Mori F, Masaki A, et al. (2013) Angioimmunoblastic T-cell lymphoma mice model. Leuk Res 37: 21-27. Zhan HQ, Li XQ, Zhu XZ, Lu HF, Zhou XY, et al. (2011) Expression of follicular helper T cell markers in nodal peripheral T cell lymphomas: a tissue microarray analysis of 162 cases. J.Clin.Pathol 64: 319-324. Ellyard JI, Chia T, Rodriguez-Pinilla SM, Martin JL, Hu X, et al. (2012) Heterozygosity for Roquinsan leads to angioimmunoblastic T-cell lymphoma-like tumors in mice. Blood 120: 812-821. Palomero T, Couronne L, Khiabanian H, Kim MY, Ambesi-Impiombato A, et al. (2014) Recurrent mutations in epigenetic regulators, RHOA and FYN kinase in peripheral T cell lymphomas. Nat Genet 46: 166-170. Sakata-Yanagimoto M, Enami T, Yoshida K, Shiraishi Y, Ishii R, et al. (2014) Somatic RHOA mutation in angioimmunoblastic T cell lymphoma. Nat Genet 46: 171-175. Yoo HY, Sung MK, Lee SH, Kim S, Lee H, et al. (2014) A recurrent inactivating mutation in RHOA GTPase in angioimmunoblastic T cell lymphoma. Nat Genet 46: 371-375. Lemonnier F, Couronne L, Parrens M, Jais JP, Travert M, et al. (2012) Recurrent TET2 mutations in peripheral T-cell lymphomas correlate with TFH-like features and adverse clinical parameters. Blood 120: 1466-1469. Cairns RA, Iqbal J, Lemonnier F, Kucuk C, de Leval L, et al. (2012) IDH2 mutations are frequent in angioimmunoblastic T-cell lymphoma. Blood 119: 1901-1903. Cairns RA, Mak TW (2013) Oncogenic isocitrate dehydrogenase mutations: mechanisms, models, and clinical opportunities. Cancer Discov 3: 730-741. Palacios EH, Weiss A (2004) Function of the Src-family kinases, Lck and Fyn, in T-cell development and activation. Oncogene 23: 7990-8000. Yu D, Tan AH, Hu X, Athanasopoulos V, Simpson N (2007) Roquin represses autoimmunity by limiting inducible T-cell co-stimulator messenger RNA. Nature 450: 299-303. Heissmeyer V, Vogel KU (2013) Molecular control of Tfh-cell differentiation by Roquin family proteins. Immunol Rev 253: 273-289. Vinuesa CG, Cook MC, Angelucci C, Athanasopoulos V, Rui L, et al. (2005) A RING-type ubiquitin ligase family member required to repress follicular helper T cells and autoimmunity. Nature 435: 452-458. Auguste T, Travert M, Tarte K, Ame-Thomas P, Artchounin C, Martin-Garcia N, et al. (2013) ROQUIN/RC3H1 alterations are not found in angioimmunoblastic T-cell lymphoma. PLoS One 8: e64536. Basso K, Dalla-Favera R (2015) Germinal centres and B cell lymphomagenesis. Nat Rev Immunol 15: 172-184. Basso K, Dalla-Favera R (2012) Roles of BCL6 in normal and transformed germinal center B cells. Immunol Rev 247: 172-183. Cattoretti G, Pasqualucci L, Ballon G, Tam W, Nandula SV, et al. (2005) Deregulated BCL6 expression recapitulates the pathogenesis of human diffuse large B cell lymphomas in mice. Cancer Cell 7: 445-455. Baron BW, Anastasi J, Montag A, Huo D, Baron RM, et al. (2004) The human BCL6 transgene promotes the development of lymphomas in the mouse. Proc Natl Acad Sci USA 101: 14198-14203. Baron BW, Anastasi J, Hyjek EM, Bies J, Reddy PL, et al. (2012) PIM1 gene cooperates with human BCL6 gene to promote the development of lymphomas. Proc Natl Acad Sci USA 109: 5735-5739. Baron BW, Anastasi J, Bies J, Reddy PL, Joseph L, et al. (2014) GFI1B, EVI5, MYB--additional genes that cooperate with the human BCL6 gene to promote the development of lymphomas. Blood Cells Mol Dis 52: 68-75. Shaffer AL, Yu X, He Y, Boldrick J, Chan EP, et al. (2000) BCL-6 represses genes that function in lymphocyte differentiation, inflammation, and cell cycle control. Immunity 13: 199-212. Phan RT, Dalla-Favera R (2004) The BCL6 proto-oncogene suppresses p53 expression in germinal-centre B cells. Nature 432: 635-639. Okada T, Moriyama S, Kitano M (2012) Differentiation of germinal center B cells and follicular helper T cells as viewed by tracking Bcl6 expression dynamics. Immunol Rev 247: 120-132. Kitano M, Moriyama S, Ando Y, Hikida M, Mori Y, et al. (2011) Bcl6 protein expression shapes pre-germinal center B cell dynamics and follicular helper T cell heterogeneity. Immunity 34: 961-972. Hutloff A, Dittrich AM, Beier KC, Eljaschewitsch B, Kraft R, et al. (1999) ICOS is an inducible T-cell co-stimulator structurally and functionally related to CD28. Nature 397: 263-266. Greenwald RJ, Freeman GJ, Sharpe AH (2005) The B7 family revisited. Annu Rev Immunol 23: 515-548. Gigoux M, Shang J, Pak Y, Xu M, Choe J, et al. (2009) Inducible costimulator promotes helper T-cell differentiation through phosphoinositide 3-kinase. Proc Natl Acad Sci USA 106: 20371-20376. Rolf J, Bell SE, Kovesdi D, Janas ML, Soond DR, et al. (2010) Phosphoinositide 3-kinase activity in T cells regulates the magnitude of the germinal center reaction. J Immunol 185: 4042-4052. Xu H, Li X, Liu D, Li J, Zhang X, et al. (2013) Follicular T-helper cell recruitment governed by bystander B cells and ICOS-driven motility. Nature 496: 523-527. Grimbacher B, Hutloff A, Schlesier M, Glocker E, Warnatz K, et al. (2003) Homozygous loss of ICOS is associated with adult-onset common variable immunodeficiency. Nat Immunol 4: 261-268. Warnatz K, Bossaller L, Salzer U, Skrabl-Baumgartner A, Schwinger W, et al. (2006) Human ICOS deficiency abrogates the germinal center reaction and provides a monogenic model for common variable immunodeficiency. Blood 107: 3045-3052. Bossaller L, Burger J, Draeger R, Grimbacher B, Knoth R, et al. (2006) ICOS deficiency is associated with a severe reduction of CXCR5+CD4 germinal center Th cells. J Immunol 177: 4927-4932. Tafuri A, Shahinian A, Bladt F, Yoshinaga SK, Jordana M, et al. (2001) ICOS is essential for effective T-helper-cell responses. Nature 409: 105-109. McAdam AJ, Greenwald RJ, Levin MA, Chernova T, Malenkovich N, et al. (2001) ICOS is critical for CD40-mediated antibody class switching. Nature 409: 102-105. Dong C, Juedes AE, Temann UA, Shresta S, Allison JP, et al. (2001) ICOS co-stimulatory receptor is essential for T-cell activation and function. Nature 409: 97-101. Mak TW, Shahinian A, Yoshinaga SK, Wakeham A, Boucher LM, et al. (2003) Costimulation through the inducible costimulator ligand is essential for both T helper and B cell functions in T cell-dependent B cell responses. Nat Immunol 4: 765-72. Linterman MA, Rigby RJ, Wong R, Silva D, Withers D, et al. (2009) Roquin differentiates the specialized functions of duplicated T cell costimulatory receptor genes CD28 and ICOS. Immunity 30: 228-241. Okamoto T, Saito S, Yamanaka H, Tomatsu T, Kamatani N, et al. (2003) Expression and function of the co-stimulator H4/ICOS on activated T cells of patients with rheumatoid arthritis. J Rheumatol 30: 1157-1163. Ruth JH, Rottman JB, Kingsbury GA, Coyle AJ, Haines GK, et al. (2007) ICOS and B7 costimulatory molecule expression identifies activated cellular subsets in rheumatoid arthritis. Cytometry A 71: 317-326. Vogelzang A, McGuire HM, Yu D, Sprent J, Mackay CR, et al. (2008) A fundamental role for interleukin-21 in the generation of T follicular helper cells. Immunity 29: 127-137. Vogelzang A, McGuire HM, Liu SM, Gloss B, Mercado K, et al. (2014) IL-21 contributes to fatal inflammatory disease in the absence of Foxp3+ T regulatory cells. J Immunol 192: 1404-1414. Gigoux M, Lovato A, Leconte J, Leung J, Sonenberg N, et al. (2014) Inducible costimulator facilitates T-dependent B cell activation by augmenting IL-4 translation. Mol Immunol 59: 46-54. Chen H, Fu T, Suh WK, Tsavachidou D, Wen S, et al. (2014) CD4 T cells require ICOS-mediated PI3K signaling to increase T-Bet expression in the setting of anti-CTLA-4 therapy. Cancer Immunol Res 2014. 2: 167-176. Guedan S, Chen X, Madar A, Carpenito C, McGettigan SE, et al. (2014) ICOS-based chimeric antigen receptors program bipolar TH17/TH1 cells. Blood 124: 1070-1080. Teichmann LL, Cullen JL, Kashgarian M, Dong C, Craft J, et al. (2015) Local triggering of the ICOS coreceptor by CD11c(+) myeloid cells drives organ inflammation in lupus. Immunity 42: 552-565. Liu D, Xu H, Shih C, Wan Z, Ma X, et al. (2014) T-B-cell entanglement and ICOSL-driven feed-forward regulation of germinal centre reaction. Nature 10. Shulman Z, Gitlin AD, Weinstein JS, Lainez B, Esplugues E, et al. (2014) Dynamic signaling by T follicular helper cells during germinal center B cell selection. Science 345: 1058-1062. Calpe S, Wang N, Romero X, Berger SB, Lanyi A, et al. (2008) The SLAM and SAP gene families control innate and adaptive immune responses. Adv Immunol 97: 177-250. Cannons JL, Tangye SG, Schwartzberg PL (2011) SLAM family receptors and SAP adaptors in immunity. Annu Rev Immunol 29: 665-705. Veillette A (2010) SLAM-family receptors: immune regulators with or without SAP-family adaptors. Cold Spring Harb Perspect Biol 2: a002469. Morra M, Simarro-Grande M, Martin M, Chen AS, Lanyi A, et al. (2001) Characterization of SH2D1A missense mutations identified in X-linked lymphoproliferative disease patients. J Biol Chem 276: 36809-36816. Davidson D, Shi X, Zhang S, Wang H, Nemer M, et al. (2004) Genetic evidence linking SAP, the X-linked lymphoproliferative gene product, to Src-related kinase FynT in T(H)2 cytokine regulation. Immunity 21: 707-717. Cannons JL, Yu LJ, Jankovic D, Crotty S, Horai R, et al. (2006) SAP regulates T cell-mediated help for humoral immunity by a mechanism distinct from cytokine regulation. J Exp Med 203: 1551-1565. McCausland MM, Yusuf I, Tran H, Ono N, Yanagi Y, et al. (2007) SAP regulation of follicular helper CD4 T cell development and humoral immunity is independent of SLAM and Fyn kinase. J Immunol 178: 817-828. Veillette A, Zhang S, Shi X, Dong Z, Davidson D, et a. (2008) SAP expression in T cells, not in B cells, is required for humoral immunity. Proc Natl Acad Sci USA 105: 1273-1278. Qi H, Cannons JL, Klauschen F, Schwartzberg PL, Germain RN (2008) SAP-controlled T-B cell interactions underlie germinal centre formation. Nature 455: 764-769. Cannons JL, Qi H, Lu KT, Dutta M, Gomez-Rodriguez J, et al. (2010) Optimal germinal center responses require a multistage T cell:B cell adhesion process involving integrins, SLAM-associated protein, and CD84. Immunity 32: 253-265. Zhong MC, Veillette A (2013) Critical role of SAP in progression and reactivation but not maintenance of T cell-dependent humoral immunity. Mol Cell Biol 33: 1223-1232. Merrill JT (2013) Co-stimulatory molecules as targets for treatment of lupus. Clin Immunol 148: 369-375. Fruman DA, Rommel C (2014) PI3K and cancer: lessons, challenges and opportunities. Nat Rev Drug Discov 13: 140-156. Veillette A, Guo H (2013) CS1, a SLAM family receptor involved in immune regulation, is a therapeutic target in multiple myeloma. Crit Rev Oncol Hematol 88: 168-177.